I’ll be doing a little touring for The Doubt Factory over the next couple weeks. DC, Santa Cruz, San Francisco, Austin, and Boulder. 5015 Connecticut Ave NW, Washington, D.C.
Oct 18, The Texas Teen Book Festival, St. Edward’s University. Paolo, it was an honor to meet you at Chautauqua the other night; I’m the Clarion failure who was sitting to your left. As I said, you are one of the (very) few SF writers to emerge in the 21st century whose work I wholeheartedly embrace. Smart, dark, thought-provoking — really great. 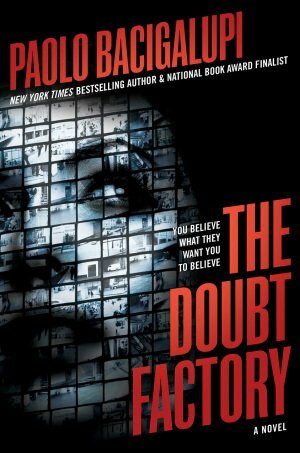 Looking forward to reading “The Doubt Factory” — I apologize that I had (inadvertently?) pre-ordered it for my Kindle; would have been more fun to have you sign. But really looking forward to the novel set in the “Tamarisk Hunter” world. Don’t feel you have to respond, but there were so many questions I would have loved to discuss the other night. Here’s one: You seem a little put off by techno-utopians — is that a fair reading? I know I am.